Jim Oberhofer, the keynote speaker for the 2017 USTFCCCA Convention, isn’t so different from his audience on Wednesday, December 13 at Opening Session. Oberhofer, like many coaches in attendance, spends countless hours fine-tuning machines to traverse a quarter mile as quickly as possible. The former’s only go in a straight line down a strip of asphalt, while the latter’s work their way around a synthesized-rubber oval. 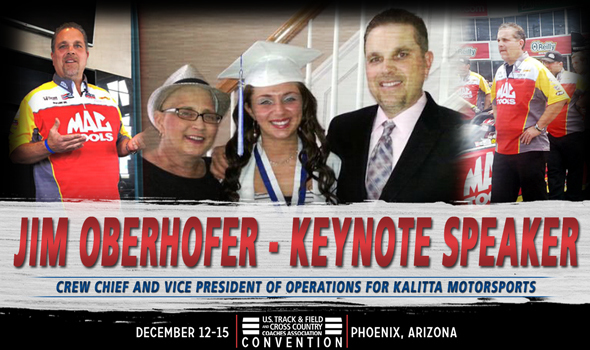 Since 1983, Oberhofer has been deeply embedded into the world of drag racing. He started cleaning parts for Kalitta Motorsports and now 34 years later, Oberhofer is the Vice President of Operations for that same organization and serves as crew chief for the Mac Tools Top Fuel Dragster driven by Doug Kalitta. Oberhofer is also a best-selling author. He wrote “Top Fuel for Life: Life Lessons from a Crew Chief” after his wife lost a fight with stage 4 metastatic lung cancer in 2013. In those 262 pages, Oberhofer details his personal mission and the lessons he learned from his wife’s battle. Past keynote speakers at the USTFCCCA Convention included current NCAA President Mark Emmert, former NCAA President Myles Brand and current President and Chief of Operations for the Golden State Warriors Rick Welts. The 2017 USTFCCCA Convention will be held from Tuesday, December 12 through Friday, December 15 at the JW Marriott Desert Ridge Resort & Spa in Phoenix, Arizona. Early registration for the 2017 USTFCCCA Convention is open until Thursday, November 30 at 11:59 pm ET. Once December 1 hits, the cost of registration goes up $50.